Lately my son has been scared playing baseball. When he gets up to bat, he will step out of the batter’s box once the pitcher throws the ball. He has been hit numerous times and now the fear is a constant in his mind and it seemed to be weighing heavily on him. No matter what was said, it didn’t matter, all he could envision was being hit by the pitch again and again. I wonder how many times we have been scared…scared to do something, scared to try something…scared to take that leap….that leap of faith. Like me talking to my son, trying to coach him and ease his fears, God is there doing the same thing, whisper “Its ok! You can do this!” How many times have we allowed the fear, that emotion to drown out God’s coaching voice? Sometimes in the midst of your fear you have to pause, take a deep breath, ignore the emotion and focus on God! Lately it seems as if my faith is being tested and the path is a bit rocky. I know in the big picture that I cannot see, God has his plans in motion. I have talked to God, sharing my feelings….He knows them before I speak them…..So I have heard all day to “Hold on”, “Wait”, “Be patient” and it has been difficult. I want to cry out why, and I want to question God, and each time I begin down the negative path…doubt, fear, questioning my faith, my belief, I hear…”Wait”, “Hold on”. Over a week ago this was my verse of the day and it seemed to fit. I rarely check my verse of the day on my iPod, but for whatever reason (God prodding! ), that evening I decided to check it. It seemed to fit the issue of the day I had heard about… What really stuck out at me, “not to your own interests, but to the interests of others.” – Humility! We’ve got to stop thinking of ourselves, and just listen. Listen to God, listen to others. We need to start judging less, and putting the interest of others before us..
One can only imagine the impact this would have if ALL Christians lived humbly….. Rain Heard the song “Washed by the Water” by Needtobreathe on the radio and had me thinking about the rain. Rain seems to quench the thirst of the ground, the flowers, and the trees. Rain washes away my sins, and my disappointments. Rain quenches my thirst for Jesus, salvation, and the new. I love to listen to the rain as it falls, its soothing, much like Jesus soothing us through hard times. It also reminds me that Jesus washes away my sins, takes away my disappointments and He quenches my thirst for salvation. Currently I am on a path with an unknown destination..scary? Only a little bit. During this season in our life, we struggle to make ends meet on weekly basis. God has been providing, as always. Even though he provides, there are those last minutes freak out times worrying where the money will come from….yet, God provides and God is here. Lately I have prayed for focus and direction and I have tried to listen by reducing the unneeded sound, distractions, I face. At this unemployment part in my life, I am trying to figure out which way to go…. Running my own bookkeeping business also pops up and I question this one as well. Is this my chosen path or is it God’s. I have issues just being controlled by bosses or owners, and God knows this. So I continue to ask for “proof” with this path, God continues to show me…. I currently imagine God up there listening to me, and ready to slam me. I continue to ask for proof over and over, even when proof is given. Much like a co-worker that asks you 10 times how to do that 1 thing…that always drives me crazy. Or the kids who ask over and over, even when the answer is given, over and over….Yet Isaiah 58:11 says “The Lord will guide you continually, and satisfy your soul in drought, and strengthen your bones; You shall be like a watered garden, and like a spring of water, whose waters do not fail.” Yet I am like that child, that co-worker, needing to know over and over…..
Back in October 2010, I completed all necessary classes to obtain my BS in Accounting. Went through all the paper work just to be told I had to wait until I completed all the necessary classes to obtain my BS in Business Administration. Though I have to wait until July/Aug to get both diploma’s…I was still excited to have completed a goal. 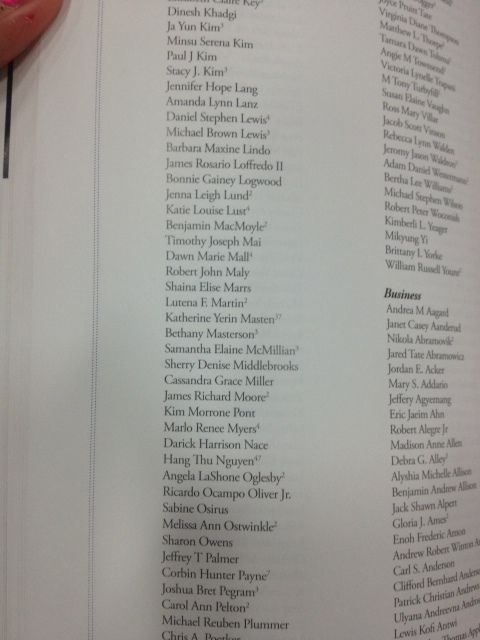 So, the other day I was looking around at Liberty’s graduation list and found my brothers name on the 2011 Graduation list, so I decided to have a look at Liberty’s 2012 Graduation list….I was on there, yup my full name, my BS in Accounting…Yes I know I was there, I knew I had achieved it, but when I saw my name on the Graduation List, I will say I was a bit excited. It honestly felt real at that moment…Not sure how I will react when I get the diploma…!! Though I sure it will involve a huge thanks to God and tears…. I continue to pray and wonder about my direction. Not sure how all of this fits in God’s plan for me. Honestly, it seems I have more downs than ups and have been discouraged and even thought about changing my direction…Yet I pray, I ask, I seek and yes I question, and God continues to show me down this path…. Just another area of my life I have handed over to God, allowing him to be the driver…. I am restless, impatient, looking and not listening. I can’t sit still and can’t focus. It seems as if my brain is cluttered…too much thinking, doing too much, going too many ways…..yet no direction… I am not listening…. God is present and He is continuously working on me….Romans 5:3-4 says “but we also glory in tribulation, knowing that tribulation produces perseverance, character; and character, hope.” …Yet I am not trusting enough, the doubter….. The noise, the cluttered mind, the distractions, the running, all of these keeps me from listening, trusting and maintaining hope & faith in God. Yet God is talking, showing & teaching me. God is teaching this impatient woman, to have hope, to trust and most importantly, to preserve and have patience….. Though I feel I am at the end of my rope, and I also feel God. He is here, walking beside me through these trials, testing my faith, patience and hope…. As much as I want to be distracted, to run, it is time to be still, be quiet and listen…. Humbled with a Slap down! I had received a rather long email from my classmate the other morning. A few days ago I had uploaded my portion of our group paper. My classmate felt that my portion of the research paper was written solely on my opinion. She further went on to explain how the professor would not accept work based solely on someone’s opinions. So I looked over my uploaded paper….I forgot to add my references….A bit humbled….Still, I honestly wanted to send an email attacking her, but once again I heard “Let it go!”, over and over….So, I sent over my list of references. A few hours later I received another email from her….Not only did my paper not have references at the bottom, there was no citations or quotes in my paper. Nothing! Just a written paper…..A written paper that would seem like it was merely opinion and not researched. .. OUCH!!! Oh I had the smack from God! I thought I had been humbled before….nope! I can say that I am truly thankful that I did not send her a not so nice email. Knowing me, it would have been quite arrogant, cocky with a touch of rudeness and full of ignorance. Sometimes we let anger get in the way, sometimes pride takes over and sometimes simple insecurities get in the way….Sometimes we just need to get over ourselves! !